While looking over some of the RNA-seq analyses done by our summer student (former undergrad, someday grad student somewhere), I noticed something unexpected. We know that cultures in the rich medium sBHI become moderately competent when they reach high density. Their transformation frequencies reach about 10^-5 - 10^-4, which is 100-fold lower than fully induced cultures but 1000-fold higher than log phase cultures. Consistent with this, in the microarray analyses we did about 12 years ago we saw modest induction of all the competence genes except ssb in this condition (we didn't publish the data but described it as 4-20-fold induction). On the left are cells in the competence-inducing medium MIV. We see very strong induction of comE in wildtype (KW20) cells (brown dots and line), and no induction when the Sxy regulator is knocked out (blue dots and line). On the right are cells in rich medium. 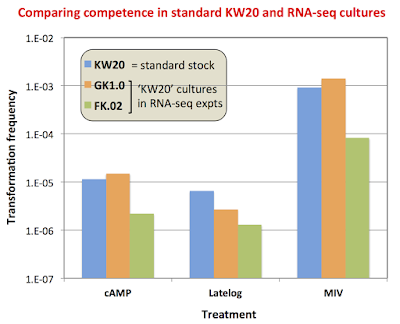 Here we see strong induction in the presence of the sxy1 hypercompetence mutation (blue dots and line) but no induction at all in the wildtype KW20 cells. 2. The sxy gene is slightly induced as culture density increases, though we don't really know how much it should be induced. 3. The genes required for induction of the competence regulon are intact in the reads of the rich-medium cultures: sxy, crp, cya. That means we didn't accidentally use a strain carrying a knockout of one of these genes instead of wildtype cells. 4. To check whether the supposedly wildtype strain might have a knockout of another gene, he looked for reads derived from antibiotic-resistance cassettes. He found a few reads of a spectinomycin cassette (like the one we have used for many of our knockouts), but the numbers were so small they're probably just contaminants. The blue-line graph shows the microarray data. 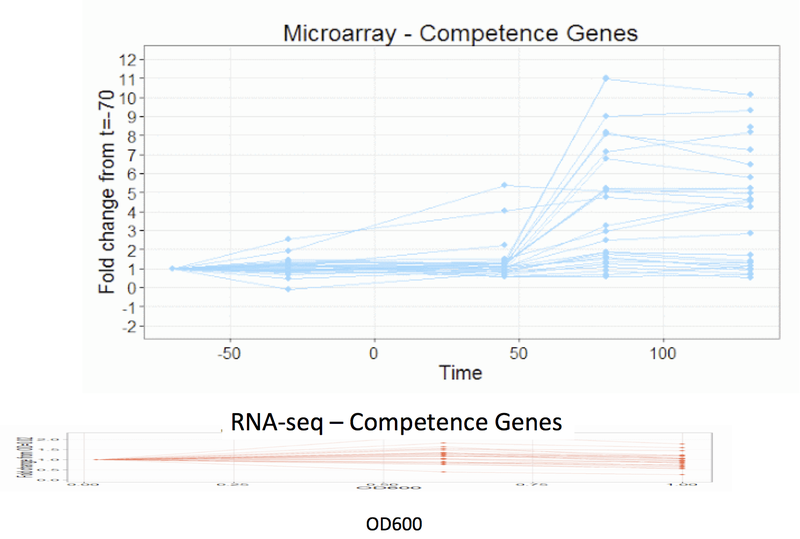 The Y-axis is fold-change in expression of each competence gene, and the X-axis is time relative to when a separate sample was removed for competence induction. The red-line graph shows the RNA-seq data, squished to make the spans of its axes roughly consistent with those of the other graph. The Y-axis is again fold-change in expression, but now the X-axis is the density of the culture, measured as OD600. 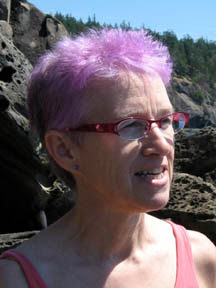 In the microarray data, some genes aren't induced at all but others are induced as much as 11-fold. In the RNA-seq data, only one gene is induced even 2-fold, and many are down-regulated. So we definitely do have a problem. So then it became my turn to do some experiments to figure out what's going on. Fortunately I had saved frozen samples of the cells used for every RNA sample we analyzed by RNA-seq. First I thawed out and transformed the three samples of supposedly wildtype cells at OD600 = 1.0. Their transformation frequencies were all a lot lower than they should have been ('FK': 3.6 x 10^-7; 'GK': 2.5 x 10^-7; 'HK': 7.6 x 1-^-7, rather than about 10^-5). 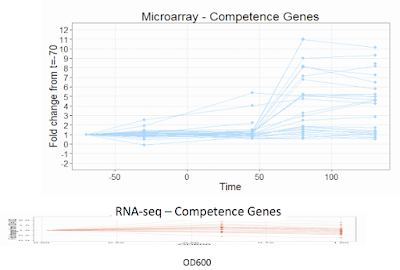 That's consistent with a genuine lack of induction of their competence genes (and not with my alternate hypothesis, that there was just some error in the analysis of this RNA-seq data). I streaked the cells on spectinomycin plates, to check if they had an unexpected spcR cassette. None grew, and they all grew on the control plates. So we didn't use any of our spc-cassette knockout mutants by mistake. Finally I inoculated two of the supposedly wildtype strains ('GK', from a plain-plate colony of the above transformation test, and 'FK', from its OD600 = 0.02 frozen sample) into rich medium, along with a wildtype control strain, and tested competence development under three conditions. The left columns show the transformation frequency seen 60 min after adding 1mM cAMP to a log-phase sBHI culture - I did these in case we didn't get normal transformation in the other tests, since this would tell us if the strains were somehow unable to produce cAMP (e.g. if they had a phosphotransferase mutation). The middle columns are cells at high density in sBHI; both of the suspect strains have near-normal transformation frequencies. The right columns are cells transferred to the competence-induction medium MIV; one of the suspect strains has normal transformation and the other is down 10-fold. So what have we learned? Mainly that there's nothing obviously wrong with the 'wildtype' cells used for the sBHI RNA-seq samples. So what should we do next? I don't know. Maybe I should repeat the competence-induction tests with fresh plates, to get better numbers. p.s. The KW20 MIV transformation frequency is slightly lower than I usually see, probably because I was testing a new scaled-down protocol that doesn't use an expensive disposable filter funnel to collect and wash the cells. Our usual protocol is to collect and wash 10 ml of cells using a Nalgene disposable filter funnel (0.2 µ size, designed for water sampling), and then resuspend them in 10 ml of MIV in a flask shaking in the waterbath for 100 min. But my new attention to economy has revealed that each funnel new costs nearly $7. So this time I just pelleted 2 ml of cells in a microfuge tube, resuspended the cells in 1 ml MIV, pelleted them again, and resuspended them in 2 ml of MIV in a large glass culture tube, which I incubated on the roller wheel in our air incubator. The transformation frequencies for KW 20 and GK are plenty high. The lower transformation of the green 'FK' sample may be because I ran out of MIV and skipped its washing step.